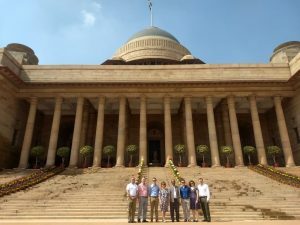 A wonderful piece from partner at The Bone and Joint Centre, Mr Peter Brownson on his recent trip with the Copeland Fellowship to India. “As President of the British Elbow and Shoulder Society, I have returned recently from a 16 day tour of India. The Copeland Fellowship was established following the death of Mr Steve Copeland, a founding member of the British Elbow and Shoulder Society, a past President and my good friend. The fellowship is an aspirational international fellowship aimed at members of the Society who have an established or emerging national/international reputation. The fellowship requires successful applicants to travel with the President of the Society at some pint in his/her 2-year tenure, to promote the Society and our Shoulder and Elbow Journal. In addition, the Fellows act as ambassadors for the Society helping to develop international links. India was an obvious choice of destination as there is much common ground between orthopaedics in India and the United Kingdom. 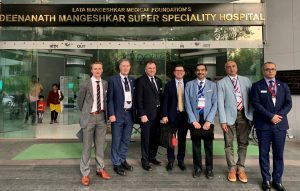 Long established links have resulted in many Indian surgeons acquiring their specialist orthopaedic training in the United Kingdom and this is particularly the case in Liverpool. As President, I was accompanied by Mr Mark Falworth (Consultant Orthopaedic Surgeon at the Royal National Orthopaedic Hospital Stanmore), Mr Cormac Kelly (Consultant Orthopaedic Surgeon at the Robert Jones and Agnes Hunt Hospital Oswestry), Mr Vijay Bhalaik (Consultant Orthopaedic Surgeon at Arrowe Park Hospital Liverpool) and Mr Marcus Bateman (Specialist Physiotherapist at The Royal Derby Infirmary) as well as my wife, Georgina and Mr Kelly’s wife, Ann. We departed the United Kingdom on 27 February 2019, arriving at our hotel in Delhi at 5am on 28 February 2019. I believe that we all managed around 3 hours of sleep before we were collected at 8:30am by Dr Matthew Varghese. This early start and long day was the harbinger of things to come, as the pace was relentless throughout our visit. Dr Varghese is the medical director at St Stephens Hospital in Delhi. Dr Varghese runs India’s only polio ward. Bill Gates, the founder of Microsoft, recently wrote about Dr Varghese in his blog – Gates’ Notes, calling him one of the five persons in the world who he thinks is a real life hero. 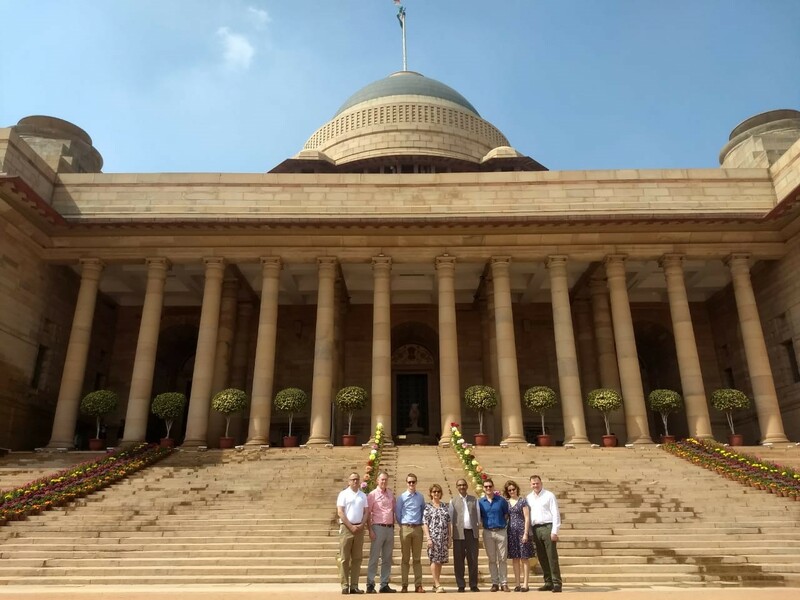 Dr Varghese is highly respected both nationally and internationally and as a result of his standing he was able to arrange a personal invitation for the BESS Copeland Fellows to take tea at the Indian President’s Palace in Delhi. As part of the invitation, the fellows were afforded a private tour of the palace and its grounds. Dr Varghese and his colleague’s hosted dinner on the first night and the following morning saw an early start and an interesting ride on the Delhi subway system from our hotel to St Stephens Hospital. The subway system is surprisingly modern and outside of rush hour to be recommended. Dr Varghese greeted us at St Stephens Hospital and we began with a tour of the hospital and the orthopaedic wards. During the visit, we saw a wide variety of orthopaedic conditions and all of the fellows were humbled by the high quality of the work being carried out by Dr Varghese and his colleagues, as well as the complexity of the surgery involved, particularly in view of the number of severe trauma cases and longstanding polio cases. After the ward round we joined our first Conference to which orthopaedic surgeons from the Delhi region had been invited. There were presentations from both the Indian and UK teams. Mr Brownson gave a presentation on the management of shoulder instability in athletes. The meeting concluded with Mr Brownson presenting Dr Varghese with a certificate to mark the joint meeting of the British Elbow and Shoulder Society with St Stephens Hospital. After our visit to St Stephens we travelled across the City to our second Conference. From 1 March to 4 March 2019, the Copeland Fellows participated in a joint meeting with the International Society for Knowledge for Surgeons on Arthroscopy and Arthroplasty (ISKSAA). ISKSAA has a membership of over 1500 surgeons, specialising in orthopaedic surgery. 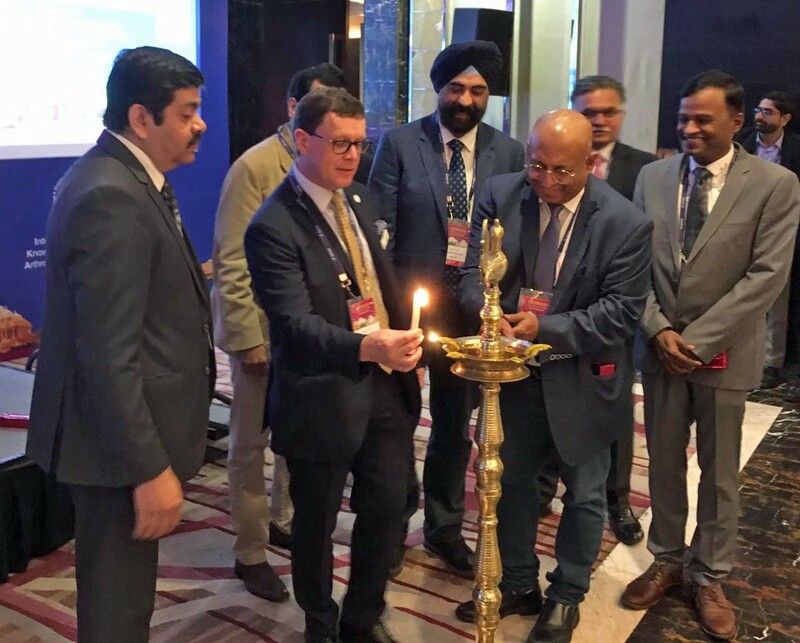 This was the 13th international congress and was held in collaboration with the BESS Copeland Fellows and the Shoulder and Elbow Society of India. The meeting attracted over 400 delegates. There were three parallel sessions running throughout the two days. Dr Pushpinder Bajaj, ISKSAA President, and Dr Lalit Maini, ISKSAA Chairman opened the meeting. Mr Brownson was invited to initiate the meeting by lighting the ceremonial candle before he gave a presentation introducing the Copeland Fellows. During the meeting, there was a combination of lectures, live surgery demonstrations, re-live surgery demonstrations, as well as discussion groups. Mr Brownson presented on the ‘BESS Guidelines for the Management of Traumatic Shoulder Dislocation’. He gave further lectures on ‘When and How to do a SLAP Repair’ as well as presenting re-live surgery videos on arthroscopic Bankart repair and superior capsular reconstruction for massive rotator cuff tears. In addition, he took part in various case discussions as part of an expert panel. The meeting concluded with presentations of commemorative certificates to Dr Bajaj, Dr Maini and Dr Easwaran. 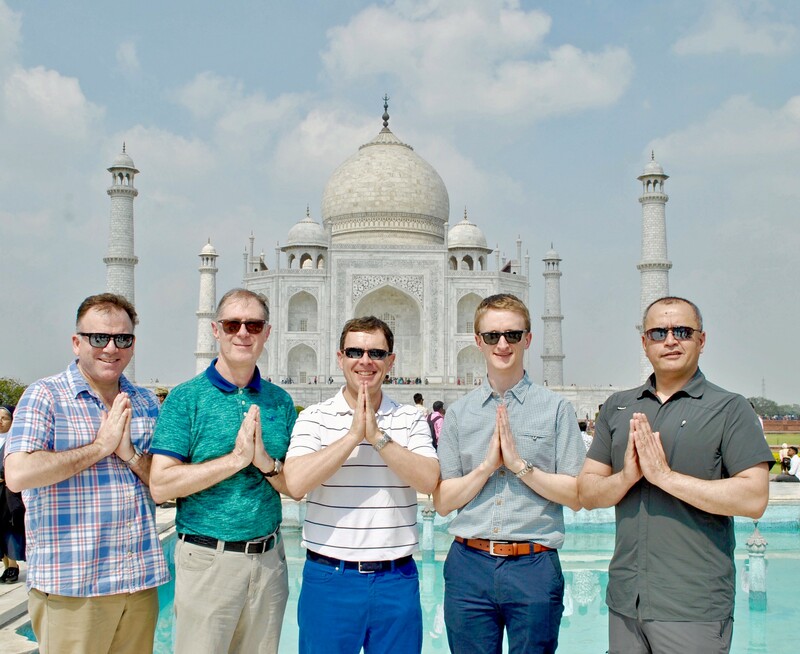 After completing our presentations at the 13th International Congress of ISKSAA, the fellows took the opportunity to visit Agra and the Taj Mahal. Travelling involved a train journey to Agra before returning to Delhi by road on the following day. Our next journey involved a flight to Aurangabad. From our base in Aurangabad, we visited two world heritage sites, the first being the Buddhist temples and cave paintings at Ajanta before driving to Pune the following day, stopping off on the way at the rock temple/cave complex in Ellora. The cave paintings in Ajanta were carried out in approximately the second century BCE and show a complexity, in terms of depth of perspective and realism that was not seen in European art until the 16/17th century. The temple at Ellora is a remarkable feat of human achievement, as it is a monolith temple, carved out of the solid granite mountainside using only hand chisels in approximately 600-1000 CE. In Pune, we attended our third conference which was the first joint BESS /SESI (British Elbow and Shoulder Society and Shoulder and Elbow Society India) meeting and it focused on shoulder and elbow arthroplasty. The meeting was held over two days and involved presentations from both Indian surgeons as well as the Copeland Fellows. The whole breadth of shoulder and elbow arthroplasty was covered. The meeting was hosted by Dr Ashish Babhulkar a founding member of SESI and its first President who now works at the Deenanth Mangeshkar Super speciality Hospital where the meeting was based. Mr Brownson once again introduced the Copeland Fellows and the idea of the Copeland Fellowship to the audience before presenting on the long-term results of The Equinoxe Shoulder Arthroplasty, as well as the structuring and maintaining of shoulder arthroplasty register. There were several case based discussions on the management of elbow pathology, as well as a debate on the management of proximal humeral fractures centred around the BESS supported ProPHER study, published in The Journal of the America Medical Association in 2015. During the meeting, Mr Brownson presented a Presidential medal to Mr Ashish Babhulkar, founding member and first president of the Shoulder and Elbow Society of India. The medal was based on the British Elbow and Shoulder Society Presidential medal and was a gift from the members of the British Elbow and Shoulder Society to the Shoulder and Elbow Society of India and was given in the spirit of “Learning together”. Dr Babhulkar then presented the medal to the current SESI President Dr Ram Chidambaram. SESI is a relatively new but rapidly growing society and it is hoped that soon the Shoulder and Elbow Society of India will become affiliated to the British Elbow and Shoulder Society to further strengthen our links. After the conclusion of the meeting in Pune, the Fellows caught an internal flight to the city of Chennai (Madras). The meeting in Chennai was held in association with the indo-British health initiative and the MIOT International Hospital. This was a two-day meeting focusing particularly on elbow pathology and unusually, for a meeting in India, it was held during the week (most meetings are held during the weekends, in order to limit surgeon’s time away from clinic and the operating theatres). The meeting was very well attended with over 350 delegates. The meeting began with a presentation by the British Deputy High Commissioner (Mr Jeremy Pilmore-Bedford), during which time he unveiled the British Elbow and Shoulder Guidelines produced by the British Elbow and Shoulder Society, specifically to coincide with the Copland Fellows visit to India. The Indo British Health Initaitive were represented by Dr Prithvi Mohandas (Founder and secretary IBHI).The guidelines contained the BESS care pathways and procedure guidelines for common shoulder and elbow conditions. The meeting was attended by the national press and photographs of the opening ceremony appeared in several Indian national daily newspapers. During the meeting, Mr Brownson took part in various case discussions, as well as giving presentations on the British Elbow and Shoulder Society guidelines for the management of traumatic shoulder instability, as well as the British Elbow and Shoulder surgical procedure guidelines on elbow arthroplasty. At the conclusion of the meeting, Mr Brownson was honoured to be awarded lifelong honorary membership of the Shoulder and Elbow Society India by Dr Ram Chidambaram in recognition for his work in bringing the Copeland Fellows to India and his work to develop links between the Shoulder and Elbow Society of Indian and the British Elbow and Shoulder Society. 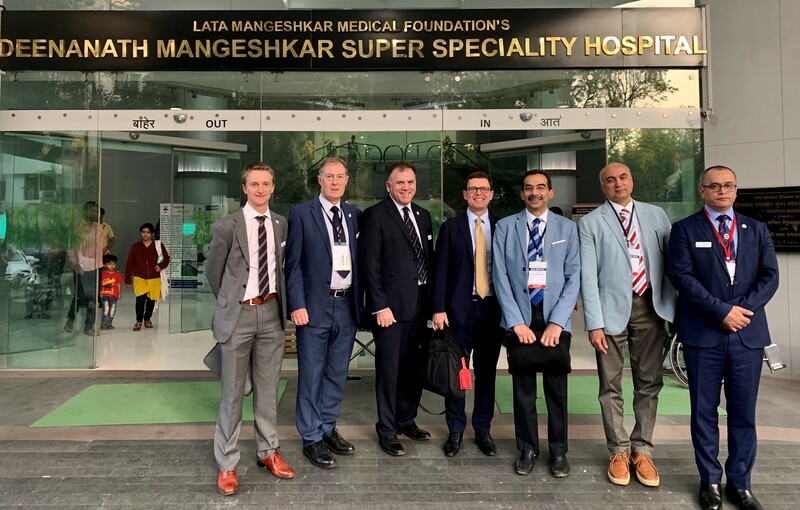 The visit to India was highly enjoyable if somewhat arduous, in that each of the Copeland Fellows was required to prepare approximately 15 presentations relevant to the field of Shoulder and Elbow Surgery, as well as taking part in all the relevant discussion groups and expert panels. The Fellows were humbled by the generosity of their Indian colleagues, as well as by the high quality of the meetings attended. 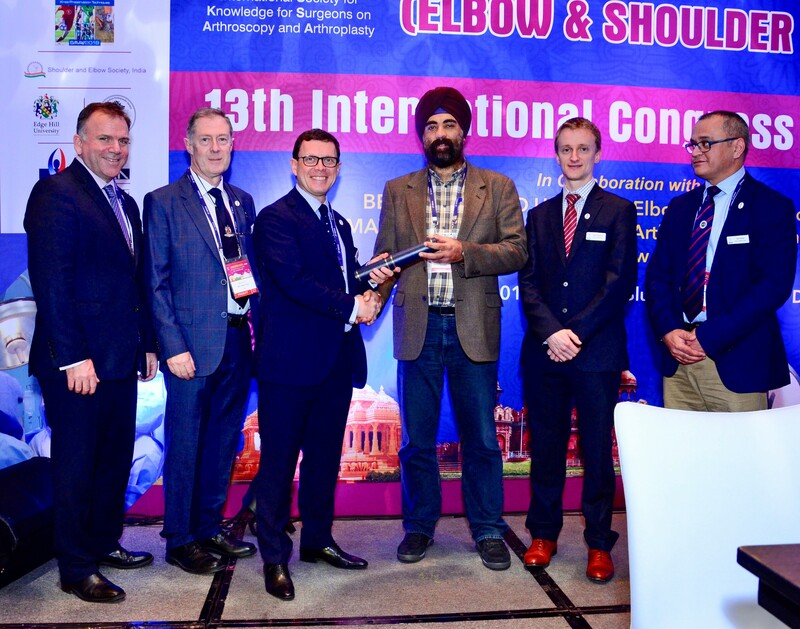 The Fellows left India with huge respect for the Shoulder and Elbow Surgeons in India, particularly taking into account the often late presentation of patients.